These days, there’s not much about the stretch of E. 12th Ave. near High Street to associate it with teetotalism. Thursday through Saturday nights, inebriated students party until the wee hours. 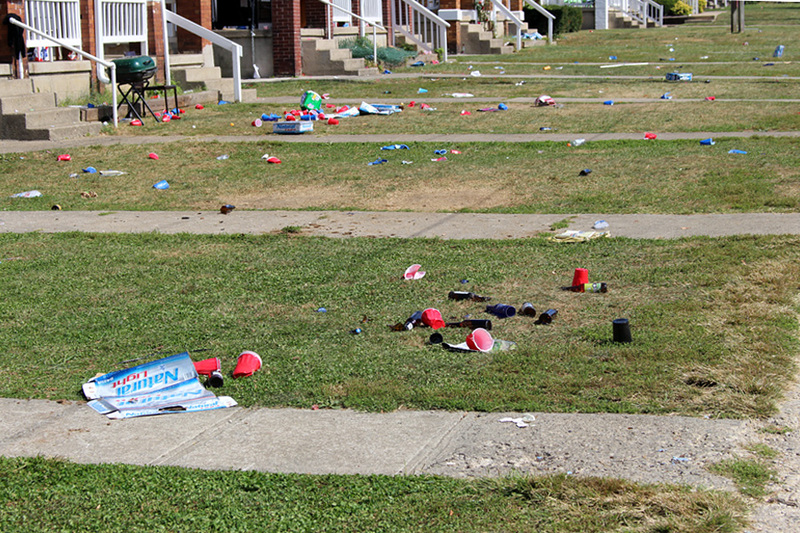 Saturday and Sunday mornings, hangover victims stagger home past streets and yards littered with bottles and cans from the previous night’s party. Yet, just a few hundred yards northeast of United Dairy Farmers’ well-stocked “Beer Barn,” stands the residence of the architect of Ohio Prohibition. For over forty years, 44 E. 12th Ave. was home to attorney James A. 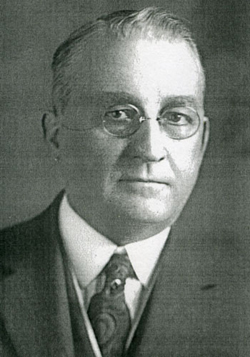 White (1872-1949), leader of the powerful Ohio Anti-Saloon League and a life-long battler for Prohibition. Born in 1872 in Bloomfield in Muskingum County, Ohio, White was educated in the public schools and received a Bachelor of Pedagogy degree from Muskingum College. He was for many years a teacher in rural one-room schoolhouses in Belmont County before being elected to the school board and then mayor of Barnesville while still in his early 20s. It was as mayor of Barnesville (pop. 3,500) that young White first battled alcohol. Belmont County had been voted dry years before but corrupt or indifferent politicians and law enforcement allowed illegal bars to flourish. Called “blind tigers,” these illicit drinking halls were loathed as dens of idleness, vice, rowdiness, vandalism, and crime. Respectable citizens hated the nuisance they created and feared the temptation they offered to young men. In the spirit of Carrie Nation, Mayor White and his supporters invaded these saloons and used hatchets, axes, and hammers to destroy their stock and smash their fixtures. His anti-alcohol campaign was so popular that he was elected to three more terms as mayor. White became a prohibitionist. Like his fellow prohibitionists, he believed alcohol was a dangerous poison that murdered men’s souls as it destroyed their bodies. He believed that alcohol was at the root of all of the nation’s problems. Crime, vandalism, vice, poverty, and perversion all flowed from the bottle. Political corruption called the bar its home. Radicalism and sedition became attractive to minds enraged by drink. Broken families, illegitimacy, adultery, birth defects, deadly accidents, and ruined health could all be laid at the door of the saloon. Even military weakness could be blamed on the poison that wreaked men's bodies and dulled their minds. An America free of alcohol could be an earthly paradise. However, if alcohol was not stopped America could become a hell. Alcohol opponents like White feared that America was being destroyed by drunkenness. They believed that the squalid, deadly, crime-ridden slums of the big cities were just a taste of America’s bleak future if drinking was not controlled. America would destroy drink or drink would destroy America. It was that simple. Stopping alcohol was a patriotic duty, an act of self-defense. Stopping drink was saving the Republic from committing suicide. To prepare himself for the fight against Demon Rum, White returned to school. He received a B.S. and an M.S. from Muskingum College and, in 1906, an LL.B. from Ohio Northern University. On graduation, he moved to Columbus to join the fight. White found his place in the anti-alcohol fight in an organization called The Anti-Saloon League. The Anti-Saloon League had been born in Oberlin, Ohio in 1883 as a federation of churches opposed to drink. Its top leaders were nearly all Ohio men. The A.S.L. had its national headquarters in Westerville, Ohio. Distinct from other temperance groups, the A.S.L. organized itself like a business. A powerful national Superintendent functioned as CEO and specialized departments staffed by trained, skilled, paid, full-time personnel carried out the organization’s goals. State organizations replicated this structure. The organization recruited and promoted based on education, experience, and ability and not just ideology. The A.S.L. derived 80-90% of its revenue from mainline Protestant churches (notably the Methodist Episcopal church) but also solicited significant contributions from businessmen like John D. Rockefeller and S.S. Kresge. Adept at fund-raising, the organization’s annual revenues rose to over a $2 million a year by the late 1910s. State chapters such as Ohio’s were themselves taking in a million dollars a year.